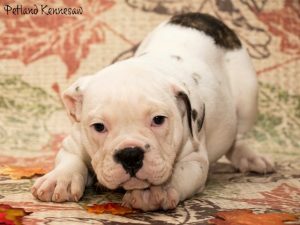 Petland Puppy Breed Education: Victorian Bulldog Basics! Victorian Bulldogs are the direct result of “recreation breeding,” and what exactly is that you ask? Recreation breeding is when a breeder resurrects a lost breed by selecting modern breeds that most embody the characteristics of the original. In 1985, a London breeder named Ken Mollett recreated a breed that shared similarities to and differences from the more modern English Bulldog. He meticulously selected fine specimens of Bull Terriers, English Bulldogs, Bull Mastiffs, and Staffordshire Bull Terriers. His attempt was to create a dog that evoked an earlier breed which had more of an athletic build, a longer muzzle and legs, and significantly smaller heads of dogs than those he’d seen in photos and portraits in the early 19th century. He made sure to only used dogs that were registered with the Kennel Club of Great Britain to maintain the purity of the dog lines. His attempt was successful and the Victorian Bulldog was born! How are they different from English Bulldogs? Some say that Victorian Bulldogs are the healthier cousin of the English Bulldog, for several reasons. Firstly, there is a distinct difference in height, because Victorian Bulldogs are about 2 inches taller than English Bulldogs. Secondly, their snouts are more pronounced and not as “smushed.” Lastly, they are significantly less heavier in the chest area. It’s also worth mentioning that Victorian Bulldogs don’t have nearly as many health concerns as the English Bulldog. Where can you get Victorian Bulldogs? They are indeed a rare, but beautiful breed. We have connections with breeders who provide healthy Victorian Bulldogs here at Petland! All of our puppies come from USDA licensed breeders and distributors with no direct violations on their latest inspection report; hobby breeders who raise their dogs in a humane manner; and local animal shelters or from members of the local community as part of Petland’s Adopt-A-Pet program. We’ve Got Puppies For Sale in Atl! Since 1967, we have been committed to helping thousands of families adopt new pets into their homes. We guarantee that our staff receives intensive training and continuing education. What’s best of all is that they love what they do, and it’s important to have a compassionate and knowledgeable staff. A major focus of our Pet Counselors is to educate people about responsible pet ownership and finding the right pet for them. This information assists customers in making informed choices that improves the quality of not only their lives, but the lives of their pets. Hobby breeders as defined by the Animal Welfare Act. These are breeders who raise their dogs in a humane and caring manner. We understand that a pet is not always in the immediate budget, but there’s finally a way to add a furry member to your family without stress and angst. You can finance puppies on sale in Atl with us. Here at Petland, we proudly offer low monthly payments for those who need it. Many people ask us if it’s strange that we offer financing for animals, but it’s actually a very common practice in the industry. We have various puppy packages, lifetime memberships, trainings, and much more. Your decision to buy a puppy at Petland is one that you won’t regret and will value exponentially! What’s Up With Walrus Puppies for Sale? We want to share some information with you that you may not already know about our Walrus puppies for sale! We get it…we really do! Sometimes it’s difficult to keep up with so many designer and new crossbreed dogs. At Petland, we’re your resource and guide to help you navigate the doggy world. Besides our wealth of knowledge about this relatively new breed, we have Walrus puppies for sale and all of the toys, food, accessories you’ll need to make your new puppy feel at home and comfortable to heighten your bonding experience. The Walrus dog is a designer cross between a Chinese Shar-Pei and a Basset Hound. His body is more of the Basset, but his skin is wrinkly and crinkly like the Shar-Pei, making him undeniably irresistible. They are technically a medium sized dog, as they range from 40 to 60 pounds. You may also see them referred to as a Ba-Shar. As with any purebred dog, there are some common health concerns. Specifically for the Walrus puppy, the combination of the Basset Hound and Shar-Pei presents some unique, but totally preventable and treatable problems. For instance, the Basset is susceptible to canine thrombopathia, foreleg lameness, and eyelid issues. With the Chinese Shar-Pei, you want to pay specific and close attention to their eyelids turning inward. This affliction is called ectropion. Both breeds are prone to hip dysplasia. Walrus puppies have a life expectancy of 9 to 11 years. How are they at home? Walrus puppies for sale are normally a show stopper and conversation starter, because they’re still kinda rare, so some research studies are rare and sparse, too. What we know for sure is that they are an affectionate breed who match very well with dog owners who live inactive and somewhat sedentary lifestyles. They aren’t going to be bouncing around and running you tirelessly. Nope! They’ll play, then lay! And though they’re not big time entertainers like some show off breeds, they are still lovable, affectionate, and comical! They’ll fair well with other dogs and even kids in the home. As we always stress, early training with Walrus puppies on sale that you purchase is key. The Shar-Pei in the Walrus puppy can be stubborn and the Basset Hound in the Walrus puppy can get easily distracted by tracking scents. Here at Petland, we have a lot of resources for you when it comes to breed knowledge and training acumen. Our staff is very friendly and knowledgeable and are waiting with answers to your questions. Contact us today! 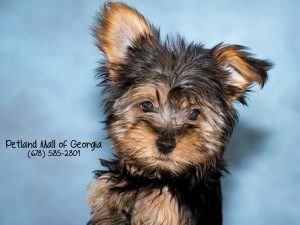 Petland Mall of Georgia: Your Perfect Yorkie Is Waiting For You! Yorkshire Terriers have been at the top as far as popularity for many years! And it’s no different here at Petland! This pint-sized companion has been charming our customers for many years as well. 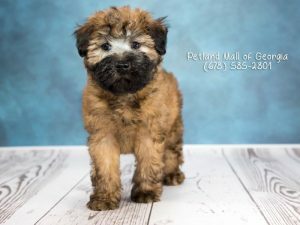 Our Yorkis for sale are literally the cutest around, check out pictures of them right here on our available puppies page! Here are 10 unique facts about Yorkis for sale that you’ll find useful when selecting one to bring home! If you can imagine, the teeny tiny Yorkie was originally bred to be an exterminator in the mid-1800s. They were used to hunt badgers, rats in mines, and foxes underground for clothing mills. The Yorkshire Terrier was officially recognized in 1885 by the AKC and was last improved upon in 2007, with breed standard physical characteristics. This breed originated from Yorkshire, England, but according to many other Yorkie reports and research this breed was “founded” by three other breeds that were brought from Scotland into England. In World War II, an American soldier found a Yorkie pup that was lost in a foxhole. She was named Smokey and went on to become one of the first therapy dogs. Some, not all, Yorkies can be yappy and tend to bark at every little thing that they hear. Apartment dwellers with neighbors and thin walls, you’re forewarned! You’ll find some Yorkis for sale that are pretty tiny, because some breeders are producing puppies at rapid and unsafe rates. As a result, they tend to have very fragile bones. Contact us directly for your Yorkie questions, as our breeders are safe, respectable, and reputable. Yorkies are prone to dental disease. Be sure to brush them daily. This helps to prevent the buildup of debris and tartar, as well as prevent gum disease. Despite being so popular and off the charts adorable, a Yorkie has only won Westminster’s Best in Show title once! That was done in 1978, and the pup’s name was Cede Higgins. A Yorkie named Sylvia was the smallest dog on record. She was a mere 4 onces, only 2.5 inches tall, and 3.5 inches long. Unfortunately, Sylvia died shortly after her second birthday, in 1945. There are tons of Yorkis for sale that are a result of crossbreeding. 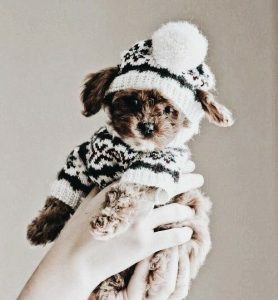 This breed is commonly used in making designer crossbred dogs which include the following combinations: Yorkiepoos (Yorkie and Poodle), the Morkie (Yorkie and Maltese), the Chorkie (Chihuahua and Yorkie) and the Corkie (Cocker Spaniel and Yorkie). 10 Things You Should Know About Shih Poo Puppies! Want to test your knowledge on one of our most popular hybrid puppies? 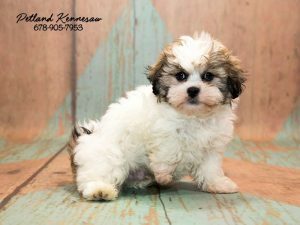 We’ve compiled 10 things you’d love to know about Shih Poo puppies and how their presence in your life will greatly skyrocket your happy meter! These Shih Poo puppies truly love to play! They can and will spend time playing with their squeaky toys, chasing balls, or playing with each other, if there’s another Shih Poo in the vicinity. They have a long lifespan, living to be about 12 to 15 years old. Shih Poos are smart, but they can be stubborn little smarties. To properly train them, you should know that they’re highly motivated by treats! They love laps! Shih Poo puppies are companion dogs and as we previously mentioned, they are complete cuddlers. They love people and need to be around their owners or other family members. One should never allow them to live outdoors. Their have soft and thick coats. While they don’t shed excessively, they require frequent grooming and trimming. Bonus – most Shih Poo puppies are partially hypoallergenic. They don’t need a lot of exercise, because these furry babies are already energetic enough. Playing is fine, but be careful not to overexert them, as it can be harmful to their health. Shih Poo puppies are bred in two variations, with the Shih Tzu being the sire and the Poodle the dam and vice versa. Some of the health problems that commonly affect both purebred Shih Tzus and Poodles aren’t typically present in their hybrid offspring. In the last two decades, Shih Poos have become a very popular hybrid breed of dogs, largely due to the Poodle’s reputation for having hypoallergenic fur. Shih Poos come in a wide variety of colors, such as all black, all white, cream, sable, tan, and any mix and combination. Petland Kennesaw believes in responsible breeding and pet ownership for everyone! Want to know more about the practice of care that goes into each and every little puppy that comes into our store? Just click here! You can also check out all our available puppies for sale right now, here is our puppies page! With Small Breed Puppies You Can Have Big Fun With Little Ones! Most people either love ‘em or leave ‘em. There are small breed puppies for sale that are cute, compact, and awesome pets chock full of personality. They weigh anywhere between 4 to 40 pounds and are typically easier to handle for children. They can live happily in any location. They are especially great for seniors, apartment dwellers, and city residents who don’t have big yards or spaces. They’re also excellent for those who don’t lead incredibly active lifestyles. Experts suggest that first time dog owners adopt or purchase small breed puppies. We’ve compiled a list of five popular small breed puppies for sale. Want to see if there’s any small breed pups for sale you want to take home, click here for our available puppies page! These little joys don’t shed, but they do require daily grooming. The Shih Tzu, also known as the “lion dog,” makes for a great family dog. They are very friendly and get along well with all creatures (even children)! This small but ferocious dog is a faithful companion and good watchdog. Though the Pekingese has an guardian nature, they’re surprisingly still suitable for families with other pets and kids and are one of the most sought after small breed puppies for sale. Boston Terriers are great family dogs, bonding well with kids and displaying friendly and cheerful dispositions more often than not. They don’t require a ton of grooming, but rather an occasional brush to get rid of excess hair. We must warn you though, they love to munch on household items, so keep lots of chew toys handy! Oh, the Pug…what’s not to love? Their small, wrinkly faces, short legs, and inquisitive personalities makes the Pug a comedic and friendly companion. The always pleasant Pug is easy to and willing to please. 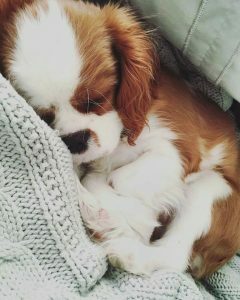 These small breed puppies snore, so you may want to consider buying some ear plugs if you decide to bring this dog into your bedroom or home for that matter! Known for being much more agreeable than the stereotypical terrier, the handsome bearded Mini Schnauzer is playful, spunky, and oh so curious. In fact, don’t put it pass them to bark at every passerby, kitty cat, or dog it sees through your window, where they’d sit for hours, by the way. Miniature Schnauzers enjoy the company of little children and make for excellent family pets. Finally…A Way to Add a Puppy to Your Family! Yes, you can finance a puppy! But make sure you do it the right way! Your kids may have asked you for a puppy year after year or even worse – month after month! You’re not against the notion, you just can’t afford one…or so you think! Finally, there’s a way to add a furry member to your family without stress and angst. You can finance a puppy with us. Here at Petland, we understand that a pet is not always in the immediate budget. We proudly offer low monthly payments for those who need it. Many people ask us if it’s strange that we offer financing for puppies, but it’s actually a very common practice in the industry and here’s why. Most of the time when people think of the cost of getting a pet, they’ll think of purchasing or adopting them. 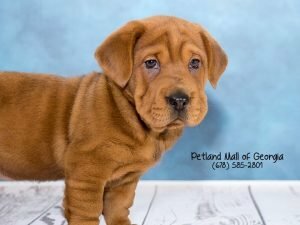 If you’re getting your puppy from a reputable breeder, the prices can range anywhere from from a few hundred bucks to several thousand dollars. Conversely, if you’re getting your puppy from an adoption shelter, the price can be under $100. The cost really depends the breed, size, age, etc. In addition to the actual price of your pet, there are additional costs. Here at Petland, when you finance a puppy, the funds can be used to support those costs. Your puppy should need a crate, food, chew toys (to save your furniture and shoes), vaccinations, and an wellness exam. These are simply the things you need to be a responsible pet owner, but they can really add up. We can take the difficulty out of this process for you. Our process is extremely simple and quick. The financing forms take soft looks on your credit. We want you to know that we will never pressure you into using financing or pet loans, but use it as an opportunity for those who need it. Don’t hesitate, call us today with any questions you might have about how to finance a puppy. You can also look at our available puppies page, right here, to see all the adorable puppies for sale we have in our store today!